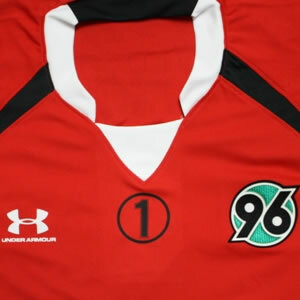 This is the special shirt which Hannover 96 will wear for their Bundesliga game against Schalke 04 tonight. As you can see, it features a No.1 in the middle of the chest, to honour Robert Enke, the Hannover goalkeeper who took his own life last Tuesday. Given that Enke was hardly a football superstar, I find the overwhelming reaction to his death surprising but also very touching. I never even saw Enke play, but I won’t mind admitting I shed a few tears on hearing about his desperately sad story – it’s clear that Germany as a nation has also been deeply affected by Enke’s loss. I guess there’s a very good reason why Enke’s death has touched so many people – in today’s frantic, information-driven world, depression affects the lives of most of us, if not directly then through friends and family. I’m sure that a suprisingly high number of professional sportsmen – who on the surface have it all but must also cope with the relentless, crushing pressure to perform – suffer from depression, but of course it is so difficult to admit it – for example, look at how people reacted when Stan Collymore admitted he suffered from depression: “Pull yourself together Stan”, “Stop being such a flake”, “Man up” etc. If one good thing comes from Enke’s tragic death, it must be the destigmatisation of mental illness – especially in sport, where it is seen, quite wrongly, as a sign of weakness. It was the fact that he wasn’t like all the other superstars. That he was still human. That played a big part for sure. Enke was consistently one of the best German goalkeepers over the past few years and he was en route to become Germany’s new #1. His contract at Hannover was expiring and he was rumored to move to a big club on a free transfer. The whole superstar thing for all the world to see was a realistic possibility for the time after the World Cup. In Germany though, he already had a similar status and in Hannover he was a legend already anyway.